Musical Fidelity V-CAN review | What Hi-Fi? We don't see many headphone amps pass through our hands, and certainly not at £100. 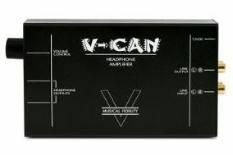 At first glance, the Musical Fidelity V-Can doesn't impress – it's a cheap-feeling black box, with a single side-mounted volume control, line in/out sockets, a 12v DC power supply, and the outputs for the all-important headphones. We gave the V-CAN Ravel's dynamic and complex Bolero and immediately noticed that the volume control is incredibly sensitive. Before even a quarter turn, the sound is loud enough to be unusable, with the balance between quiet and shattering hardly noticeable. Essentially three quarters of the volume control is redundant from the off. There's decent tonal balance and the sound produced is certainly full bodied, but there's a lack of subtlety. Any delicate top layers to the music are stripped away.